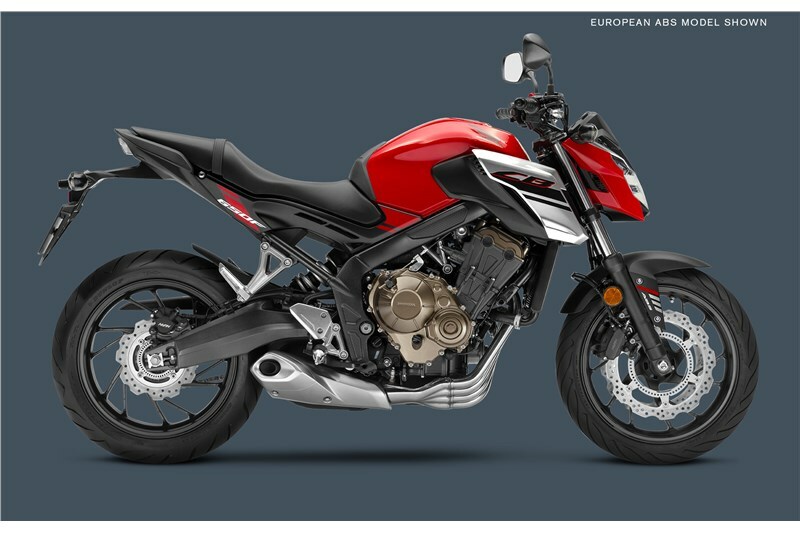 Power, style and an unmistakable growl—you get all three with the four-into-one exhaust system on the CB650F. A steel frame is strong, but not too rigid for the needs of the everyday rider. With a 57.1-inch wheelbase, the CB650F is also quick and responsive—just what a machine in this class should be. Engines like this are what Honda does best. The four-cylinder design makes it smoother and faster revving than most twins, and offers ample low to midrange torque, plus plenty of power through the entire rev range. A bike as versatile as the CB650F needs plenty of range, and the 4.6-gallon fuel tank provides just that. The CB650F’s front suspension showcases some leading-edge technology. The 41mm fork is equipped with Showa’s new Dual Bending Valve (SDBV) internals. They make the fork lighter, provide excellent suspension action, and give you cartridge-fork performance without the cartridge-fork price. The CB650F may be a terrific value, but it still offers plenty of style. Check out its mini cowl. You get just enough wind protection too. In addition to the speedometer and digital tachometer, the CB650F’s instrumentation also includes clock, trip meter and fuel gauge.